Ascend was already a leader in the global market for chemicals and fibres. Innovative products and a dedicated sales force had brought the Houston-based organisation to the forefront of a highly competitive, yet niche, market. But something was missing. Ascend’s employees lacked a sense of belonging. A sense of pride. Their loyalty to the product and customers could be seen in their work every day. But what couldn’t be seen was a sense of affinity to the brand. Ascend needed to redefine itself and renew its brand, and truly connect at an intellectual and emotional level with employees, and the marketplace. That’s when Fifth Ring came into the picture. Ascend had a great place in the market, but to stand out from competitors it needed to be clearly different. Its personality had to be known. With the support of our brand & strategy team, and further tactical support from our design and digital teams, we embarked on a journey (often literally, as we travelled from Aberdeen to Houston frequently) to discover what Ascend was made of. Certainly, no one can predict the future, but it’s great to have a leadership team that recognises that change is inevitable and we must be mentally prepared, or get run over! I see an opportunity within myself to have a winning mentality. It’s a process that Ascend leadership is creating for us. For this, we needed to understand Ascend’s brand from an employee and a customer point of view. Our team guided Ascend through an extensive competitive analysis exercise. Once a clear marketplace distinction was in place, we interviewed Ascend employees to find out what drives them and inspires the passion they have for their work. Through a series of focus groups across two of Ascend’s North American operational locations, Fifth Ring determined the essence of Ascend. The result? A captivating new tagline that encompasses Ascend’s innovative market approach and the loyal culture that is embedded in their company – inspiring everyday. From our research, Fifth Ring knew that people might respond negatively to another brand refresh from Ascend. That’s why our creative team used a colour palette and style that incorporated Ascend’s existing logo and corporate brand. Using images and inspiring stories of Ascend's employees at work and in the community helped make them feel part of the change. Fifth Ring provided Ascend with an integrated approach to communications, beginning with a brand launch. The introduction of the new brand essence would be made public during the company's fifth anniversary. The perfect opportunity to introduce this new look as the face of a maturing company. Instead of a new brand or personality that employees had to buy into, the new tagline would reflect their hard work and inspiration. They now had a company with a new look, new values and a new message they could be proud of. On June 11, employees entered an inspiring workplace. The home of Inspiring Everyday. Posters, banners, brand books and presentations could be seen throughout Ascend’s facilities. We identified how Ascend could improve its online presence and messaging to generate a stronger perception of its brand. A way to place them above the competition. The new website went live the same day, along with the support of social media channels that shared the tagline and new look. 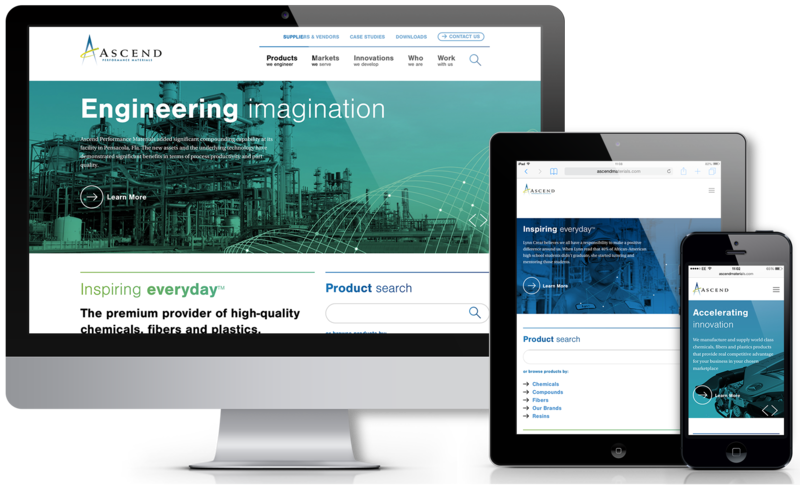 As well as telling Ascend’s story, the website was completely redesigned and re-platformed with a focus on sales and was underpinned by a new marketing automation tool to help with lead generation and campaign management. It was a new day for employees, but it was also a new day for Ascend. Customers could now see the mature new image of the company, with a brand that matched its offerings. However this is just the beginning of the Ascend journey, as the brand is embedded, new inspiring stories will be created and shared. The website and their content marketing will continue to improve and be refined with feedback from the new measurement tools and marketing automation that is in place.